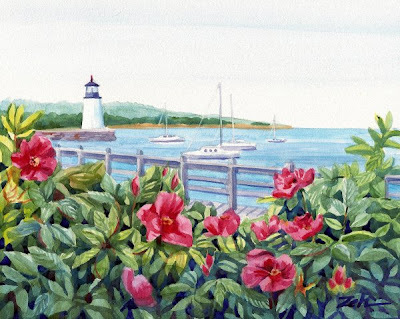 This is a typical scene on the US east coast with beach roses lining the shore and a lighthouse in the distance. If you are wondering where exactly this is, I will tell you somewhere along the Atlantic coast of North America. It has happened so many times that someone recognizes a place they love, only to be disappointed when they find out the painting was not based on that place. But since I usually take liberties with a photo that I've taken for the sake of a better painting, this one can be where you want it to be. I could almost smell the salt air and hear the sound of gulls flying overhead as I painted this scene. Wouldn't you just love to take a stroll along that boardwalk?